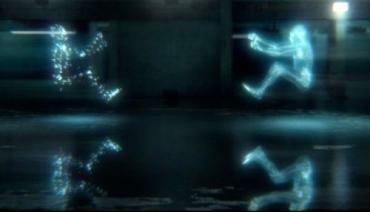 A Lexus ad currently being aired shows digitally rendered images of two crash-test dummies. One is illuminated by a smattering of lighted dots, the other a semi-solid mass. A narrator informs us that a regular dummy uses only 119 data points when collecting metrics from its collision tests while a “Lexus genius” uses over 2 million. As the commercial continues the dummies are run through a test. The first dummy recoils in some conventionally scientific way while the second—more fully delineated and dimensionalized, including, among all the organs, a fully formed beating heart—sways gracefully and appears to come to a safe stop. This advertisement may be considered an allegory of modern global commerce. The War on Contingency alludes to the concept of chance and its increasingly inimical relationship to the engineers of industry. As, very generally, the scale of commerce and its productions increases colossally—the adventure movie, the sports stadium, the smart phone—so too the enormity of the capital required to launch the products and the concomitant risk of Underperformance. To forestall the untoward vicissitudes of Chance, commerce has begun to divest itself of the corporate models of yesteryear (e.g., research & development, marketing, product design, etc.) and now deploys its energies increasingly into categories of activity that fall broadly under the rubric of Data-Mining. In what follows we seek to enumerate some of the specific strategies by which modern commerce animates this procedure. We may invoke the “sport utility truck.” By inference an evolution of the “sport utility vehicle,” it is interesting to note what interstitiary functional realm the manufacturers of this car have intended for it by the prolixity of its name. Not merely sporty or utilitarian, but—if there are doubts in the buyer’s mind—it is certainly a truck. 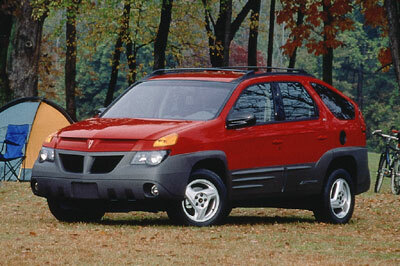 Remark the silhouette of the Pontiac Aztek and note the congeries of data-mined buyer desires welded onto one frame. 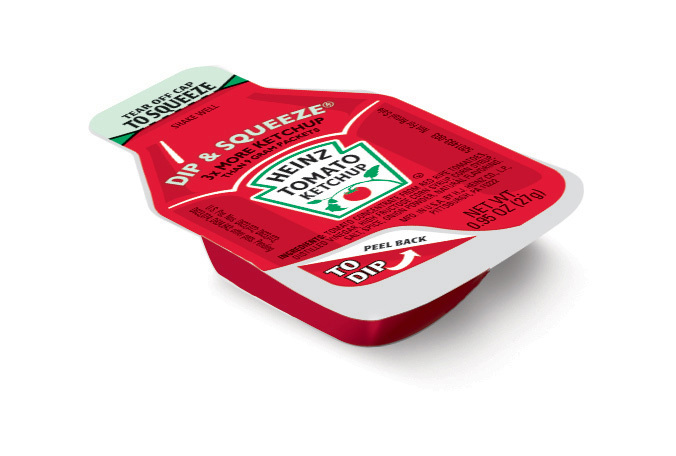 Then turn your attention to the redesign of the new Heinz Ketchup packet (which reportedly took 4 years to develop.) You may sense an eerie congruence. The latter also has a sleek nose and fuselage with a trunk—if you will—that opens for offloading. In each case the product is a reverse-engineering of consumer surveys. TRANSCENDENTAL CATEGORIES: SPEED, POWER, UBIQUITY, COLDNESS, etc. As advertising culture loses faith in its capacity to express ideas of Luxury, it turns to the vocabulary of engineering to convey sensorial experience. 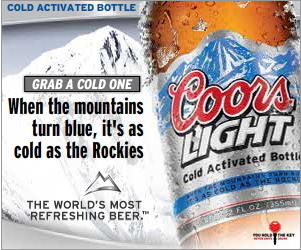 Contemporary advertisements for Coors beer show a bottle with a pair of temperature-sensitive tabs on the front label. They are marked “cold” and “super cold.” Apart from the arbitrary use of this kind of technology on a foodstuff, one questions use of nominalization instead of pure numerical data to evince the energistic state of the product. In this packaging choice we see a double hedge. The use of these tabs is clearly a gesture toward mathematics as distinct from gastronomic art. It seems the technology exists to simply place a solid-state thermometer on each beer bottle. At this point the Coors company takes a step backward from the instrumentation apposite to a laboratory and gives two gradations with the two adjectives. Even then, this is a subjectivity expropriated from the consumer (i.e. “It doesn’t feel ‘super cold’ to me,” etc.) while at the same time being a well-established advertising tactic. A cereal box may proclaim “Same Great Flavor” but it is only a printed claim; the “Super Cold” phrase only achieves illumination, if you will, when the heat-sensitive ink with which it is printed detects that pre-set temperature. There is an empirical validation of what is otherwise another of myriad statements attached to the packaging of food products. In this case, an assumption that increasing coldness correlates with increasing flavor—an assumption not universally shared among the world’s beer drinking cultures. Another tactic that seems to have gained momentum at the beginning of this century is a re-framing of the relationship between producer and consumer. The difference being not one of vocabulary but one of connotation—the “relationship” that is to be fostered is the amatory one between private citizens. The jargon derives from emotional values registered in that personal space: flirtation, resentment, familiarity, longing, concern, etc. A consumer links to a website where it is possible to view uploaded video and audio files. When attempting to click on some video the website suggests will be of interest to the viewer (based on qualitative analysis of the presently viewed item), she is informed that the second video is of a “questionable nature” and requires a login or creation of a profile to watch. In the process of the creation of this profile, the interested browser is presented with two (more) ambiguous requests: 1) to provide her phone number and 2) to allow this recently procured information to be transferred to a “social media” website. In each case, the sentiment aroused is that if the viewer provides all of this information and assents to the sharing of it, it will—with an intent similar to that of some inferred inamorado—be so much easier for recently established interests to be referred back and forth. And, should the moment overcome one, to be able to enact this transference via the instantaneous platform of telephone. If not the browser is being stubborn. As opposed to—say—indifferent. This is perhaps the most multivalent of all the proposed strategies; its existence will only be remarked as to its use in the film and music industries. For our purposes it will suffice to note the quality of advertising currently being used for a remake of the 1984 dance film Footloose. The posters are bereft of actor names, a phenomenon uncommon in a business that has historically staked its success in the promulgation of a “star system.” It would appear in fact that the poster has been conscientiously designed with a kind of opacity: from a distance of street to sign one can only discern the title in a kind of “neon sign” script, the tagline as excerpted from the original theme song (“Cut Loose”). . .and little else. The viewer momentarily has difficulty determining whether this is muted publicity for a film, or a variety of the “cinema-themed” advertising more and more current in the selling of luxury goods—e.g., the models are on a red carpet, or are “fleeing photographers,” in either case necessitating the use of dark sunglasses of the kind to be found in the display case positioned nearest the entrance to the store. 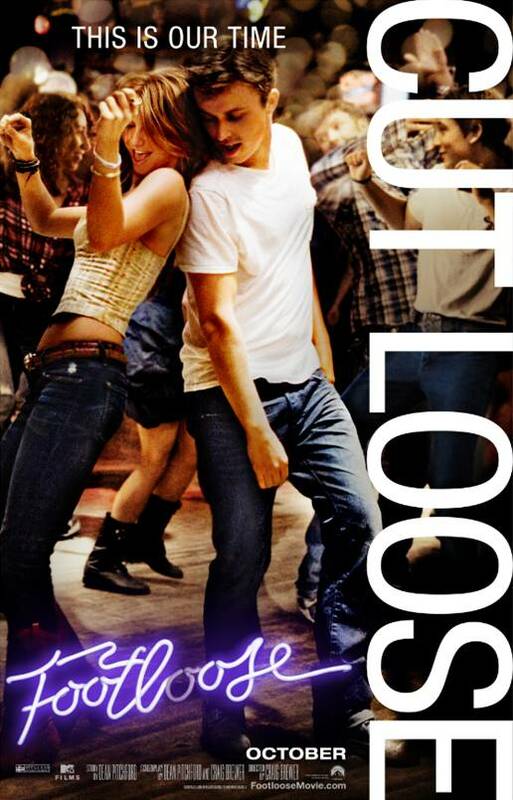 The Footloose poster blurs this distinction. It is the argument here that the story of the original film is sufficiently forgotten that only a sort of “keyword” reference to its themes (presumably those of “rebellion” and “dance”—the latter receiving in these times a certain mass culture ascendancy) will satisfy the obligations of creating a piece of cinema to be shown in movie theaters. At the same time that the “feel” of the movie is recuperated for the purposes of mustering an arsenal of sub- and quasi-conscious marketing tactics, the fairly considerable success of the original film can serve as indicator to skeptical investors of predictable profitability. There is a new model in place for creation of mass art. Whereas in times past it may be argued that concerns proposed works that in varying modes were tested by the focus group and paid audience, the present hegemony of analytic tools derived from the finance industry have qualitatively changed the structure of not only the production but the imagining of this art. The ambit of the focus group has been expanded to include entire populations; its collectively articulated feelings, opinions, desires—increasingly urged on/made available by “social media”—sifted and analyzed beforehand to provide the engineers of commerce with their products. Business, intoxicated with metrical analysis, proposes that it can bypass the existentially unreliable and expensive artist (or “creative”) and target the consumer solely for the purposes of both selling and designing that which is being sold to him. The fate of this entire model fits that of any industry at whose foundation is the metaphorical or literal mining of the Irreplaceable. The richness of the Self is a reflection of the richness of its cultural context. Very generally it is assumed that culture perennially refreshes and replenishes itself and will inform creativity in its denizens. This is an error that the modern finance-based paradigm of innovation-engineering is unconsciously and tortuously making patent. William O'Hara's "Insistent Replay," an investigation of the relationship between the two proud American industries of football and conspiracy, appeared in our fall2008 issue. His poetry appeared in our spring2008 issue. He lives in Los Angeles.